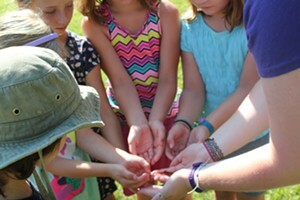 Looking Into America's Colonial Past at Crown Point State Historic Site | Destination Recreation | Kids VT - small people, big ideas! 21 Grandview Drive, Crown Point, N.Y. Since Hamilton: An American Musical captured my family's imagination last year, history has been a big topic of conversation around our dinner table. We find ourselves discussing things I never imagined my kids would be curious about, like big versus small government, the etiquette surrounding duels and George Washington's decision to step down after two terms. 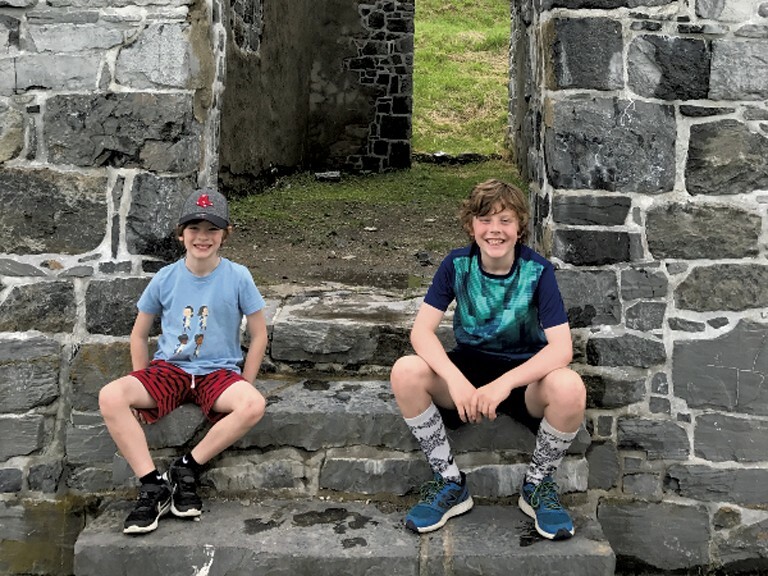 So my sons, 9-year-old Felix and 7-year-old Leo, were psyched to visit the Crown Point State Historic Site on the New York side of Lake Champlain. Only an hour's drive from Burlington, the military ruins and history museum offer a window into America's pre-revolutionary, colonial past. Two structures used by British and French soldiers as they vied for supremacy over the Champlain Valley, decades before the Revolutionary War, occupy the historic site. The French built Fort St. Frédéric in the 1730s, while the British constructed "His Majesty's Fort of Crown Point" about 20 years later. New York State acquired the remnants of both, as well as the surrounding lands, in 1910. Felix, Leo and I visited on the way home from a trip to central New York. We cruised through the park's empty entrance booth, parked near a picnic pavilion and wandered toward a row of orphaned stone columns rising from a grassy bluff. "Daddy, I think that's them!" Felix shouted as he and Leo sprinted up and over a hill. Leo and Felix sit on the stairs of "His Majesty's Fort of Crown Point"
We discovered two massive, roofless stone structures. The first one contained a series of rooms, each with a fireplace and chimney, as well as broad windows that framed a shimmering Lake Champlain in the distance. The boys began playing detective, hypothesizing this was where the soldiers lived. Sure enough, a nearby placard revealed that these were the barracks for British officers and soldiers. A fire in 1773 destroyed most of the fort, leaving just the stone skeleton behind. Felix and Leo ran their hands over the weathered rocks, happy to be able to not just see, but touch the past. We spent 45 minutes walking in and out of the barracks, climbing the sloped 30-foot grass walls built to protect the fort from invasion, and imagining crisply attired soldiers marching and drilling. A bit closer to the lake, we discovered the ruins of Fort St. Frédéric. Intentionally destroyed by the French themselves in 1759 as they retreated from 10,000 advancing British troops, it's much smaller than the British fort and far less of it remains. 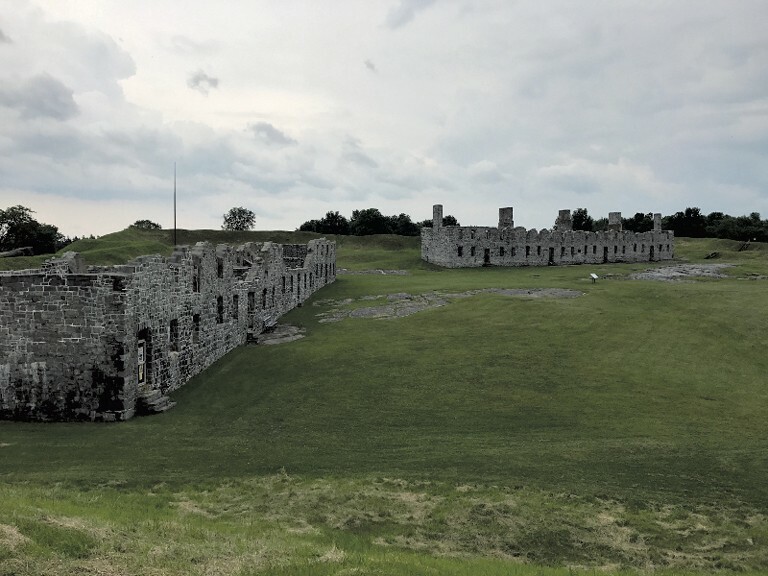 We learned that its stone walls had once been 12 feet thick at the base and four stories high, and that the mighty French cannons housed in the fort contained firepower strong enough to destroy any ship attempting passage through Lake Champlain. A small, well-maintained museum sits between the two forts. We watched a short video, which explained the region's military history and the ways in which the Iroquois and Algonquian tribes played key roles in the region. Afterward, a park service employee guided us through the galleries of artifacts. Felix and Leo were most impressed by the weapons: muskets, cannons, bayonets, bullets and ax heads. We were hoping to explore the ruins more after the museum visit, but our adventure was cut short by a storm. In less than two hours, though, we'd already received a dynamic — and real-life — lesson in history. The Crown Point Historical Site is open from sunrise to sunset year-round. The museum is open from May 6 to October 16, Thursday to Monday, from 9:30 a.m.-5 p.m. Admission is free for kids and $4 for adults.